In view of the prevailing situation especially in the aftermath of the killing of two artistes from Guwahati at Panjuri village in Karbi Anglong district on Friday, Assam Chief Minister Sarbananda Sonowal held a high-level meeting at his official residence here on Sunday in presence of Chief Secretary TY Das and Director General of Police (DGP) Kuladhar Saikia. The CM, during the meeting, took stock of the prevailing situation besides had a threadbare discussion on all aspects of law and order in the State. Chief Minister Sonowal asked DGP Kuladhar Saikia to ensure that the police force maintain constant vigilance on all activities and put spanner on any canards likely to vitiate public order and peace in the State. Referring to the killing of two young artistes, he maintained that the culprits should be brought to book and no leniency should be exhibited in dealing with the incident. The Chief Minister however, was informed that inquiry into the incident is going on right direction and a few arrests related to the killing have been made. 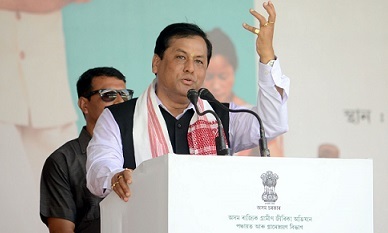 Sonowal also said that the police should be on their toes to defeat any evil agenda of rumour and trouble mongers. Chief Minister’s media and legal advisors Hrishikesh Goswami and Santanu Bharali Special DGP (Special Branch) Pallab Bhattacharyya, Additional DGP (Security) Harmeet Singh, Principal Secretary, Home LS Changsan, Principal Secretary to the Chief Minister Sanjay Lohiya were present at the meeting.